We’re both collectors. 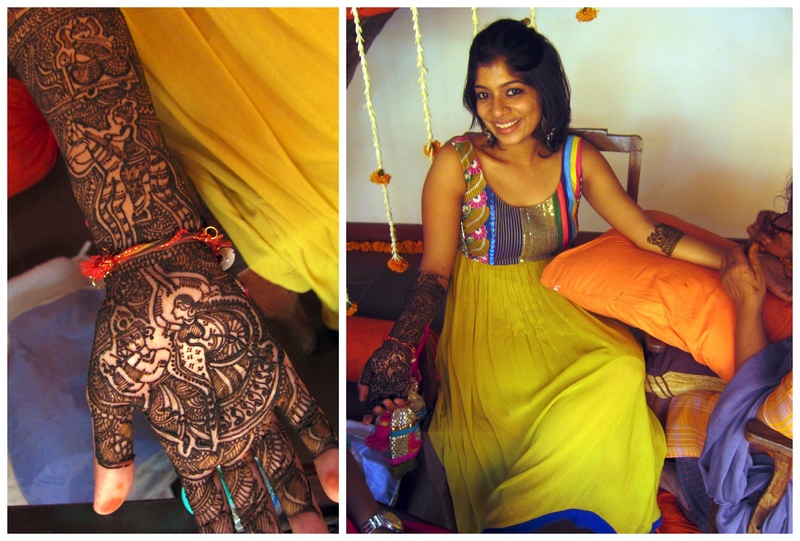 I hoard time and experiences and handmade textiles. I worry that so much of my energy goes towards stuffing my bags that I forget to be. But this is just how we be. And I’m thinking that it’s ok. I got really good at filling and emptying jars in DC and thought (hoped?) that things might change once I fled my routine. But I have so many new jars here and I just love to fill and empty. There’s no escaping life. Over skype the other day, you told me that the only thing that matters is that we get out of bed in the morning and do something. It doesn’t matter what is is… just something. Excitement, productivity, meaning, beauty are only perks. I’m grateful that lately I’ve been packing my jars tight with those perks. 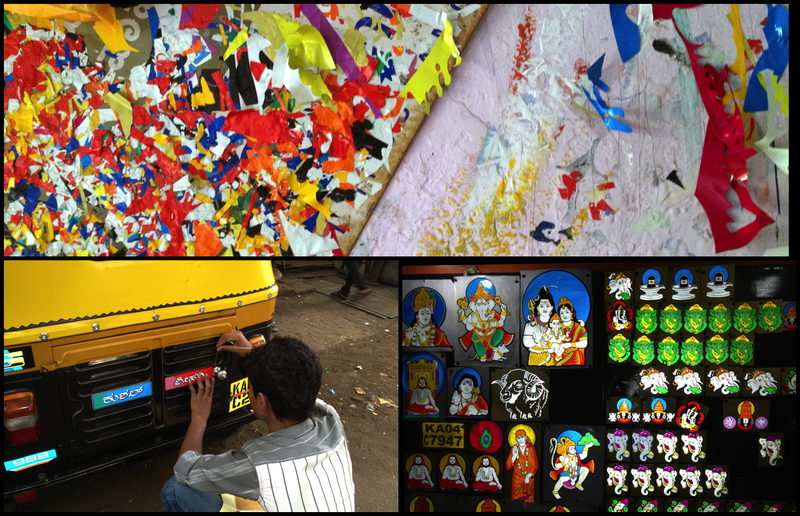 The first “work” (ha) chapter of my time in India is over, and now I’m indulging. I’m writing from a cloud. Literally. 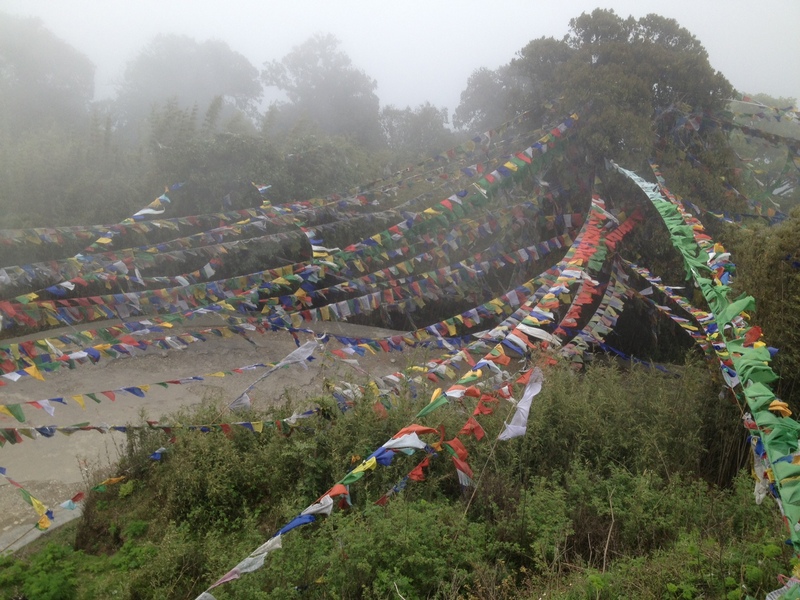 I’m sipping on hot tea in the mountains of Darjeeling and all I can see around me is cloud and prayer flags. 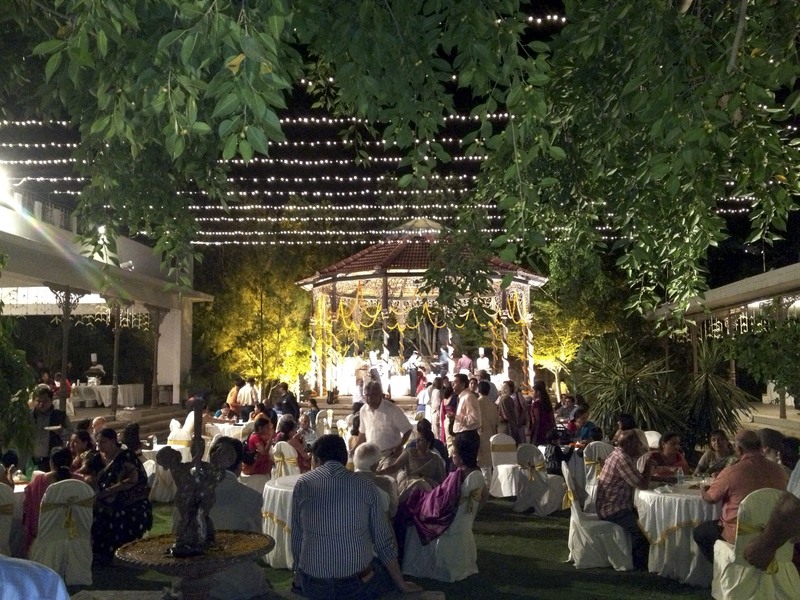 I came here from Bangalore, where I stuffed myself with dosa (recipe below) and partied hard at Priyanka’s wedding. 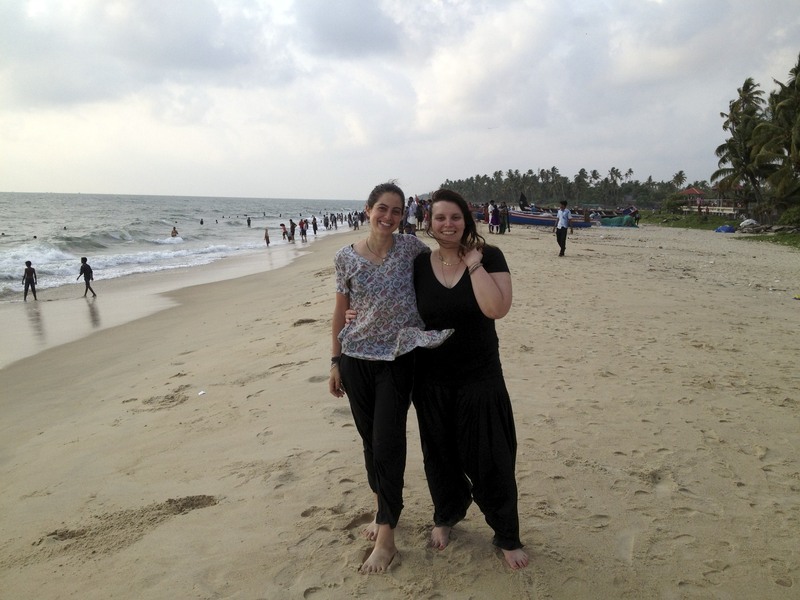 And before that, I lazed around Kerala’s beaches with Teresa, who came from Germany for the wedding. Tomorrow I embark on my trek through the foothills of the Himalayas. Meanwhile, I’ll hand-wash a bucket of dirty clothes, hang the pieces to dry, and stuff my bag to its brim feeling fulfilled as ever. I always straddle my bag to tackle it closed. Some call hoarding a problem, I call it enthusiasm. I’m not sure what to call your closet. All I know is that I’m lucky you’re coming to nyc full of practice. We’ll unpack and repack my mess in preparation for the next journey, and hopefully we’ll collect some stuff together along the way… my priority is bagels. 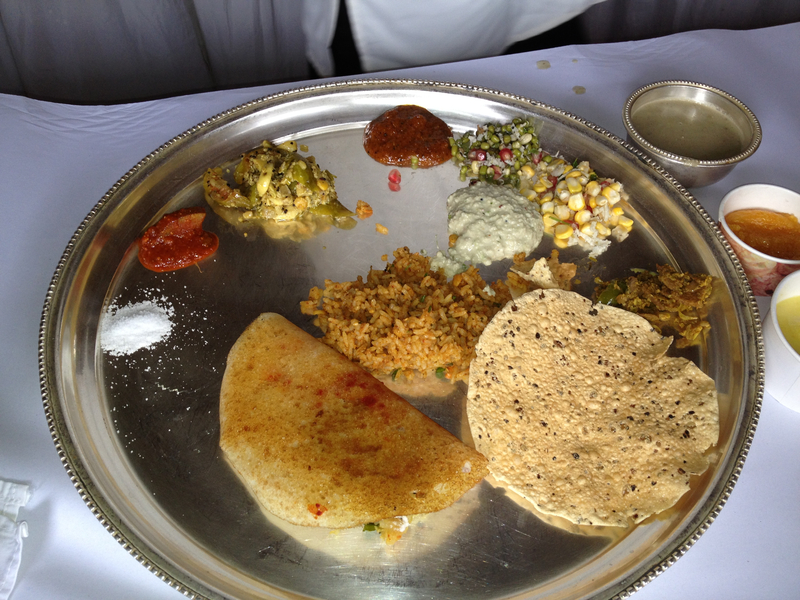 I’ve already briefed you about my dosa overdose in South India… My average was 3 a day for 14 days. Sorry I’m not sorry. People in the south eat dosa dipped in sambar (lentil stew) and coconut chutney for breakfast and I just can’t get enough. 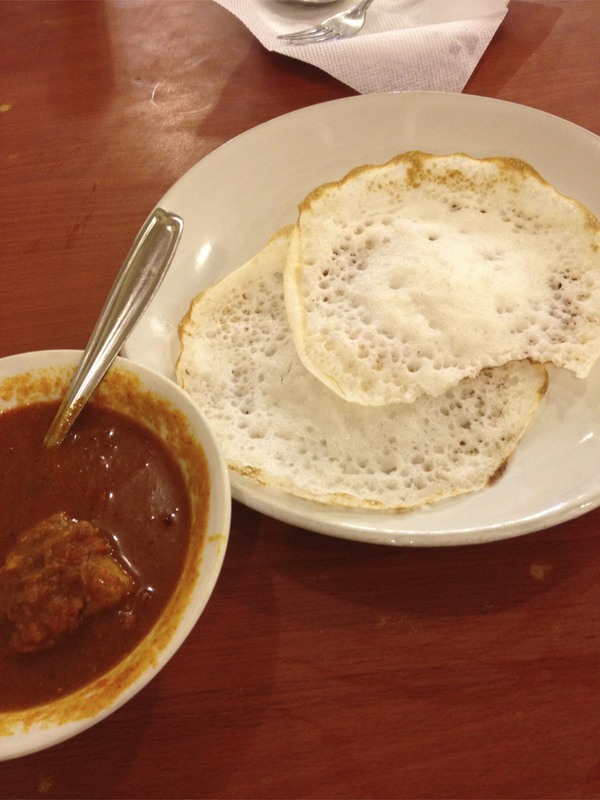 I eat dosai (plural for dosa) exactly like I used to eat Bubbe’s blintzes… over and over and over again without getting bored or too full for just one more. 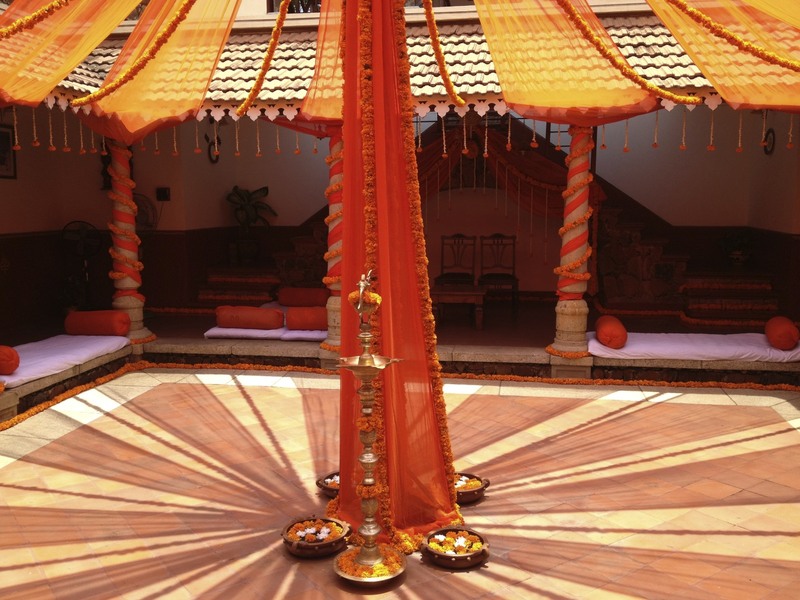 Dosa is made from a combination of rice and lentil flour, which is fermented into a sweet smelling batter. 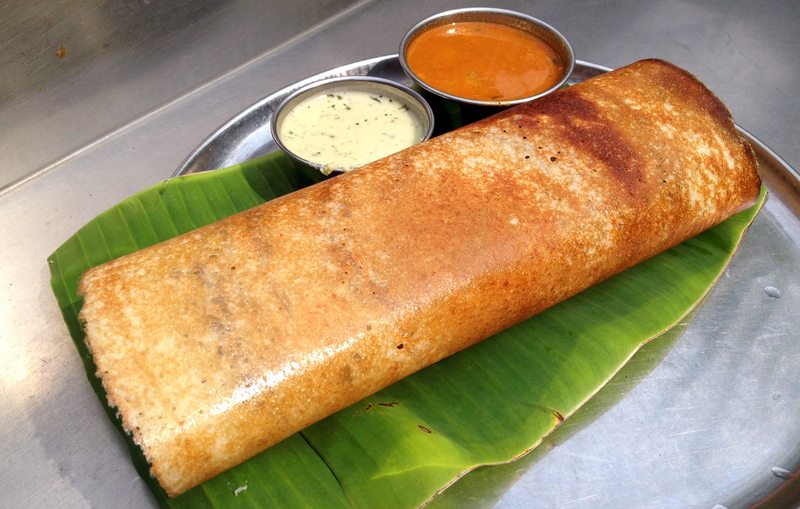 The most common filled dosa is masala dosa, whose crispy shell is stuffed with spiced potatoes and onions. 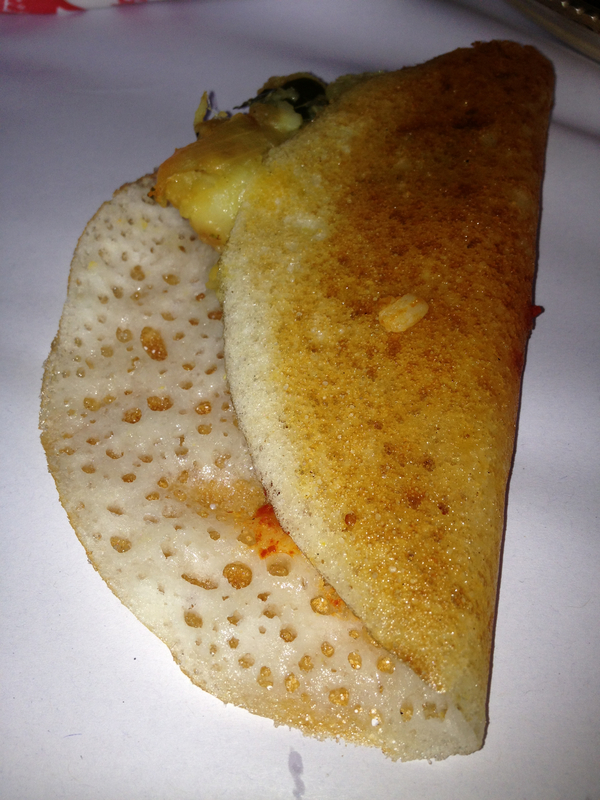 But I like my dosai plain, just like you enjoyed Bubbe’s blintz shells without the cheesy filling. There’s something perfect about how the crispness of the oily edges turns into gooey, fermented dough towards the middle. And it’s somewhat healthy… and gluten-free and vegan. 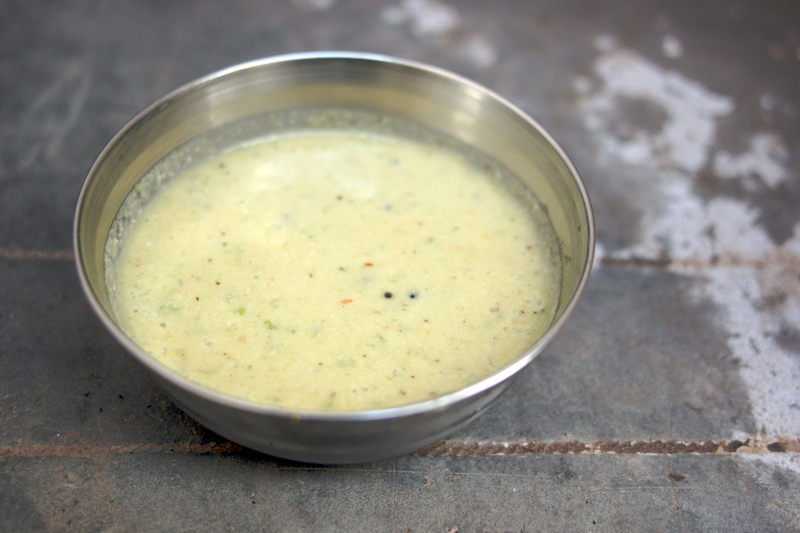 The coconut chutney and sambar add protein, hardy fiber, healthy fats and a kick of spice. My friends here joke that I have two stomachs (like a cow), and that one is for dosa only. I try to explain the special training I received as child at Bubbe’s kitchen table, where I worked on tall stacks of buttery blintzes that magically never grew shorter. 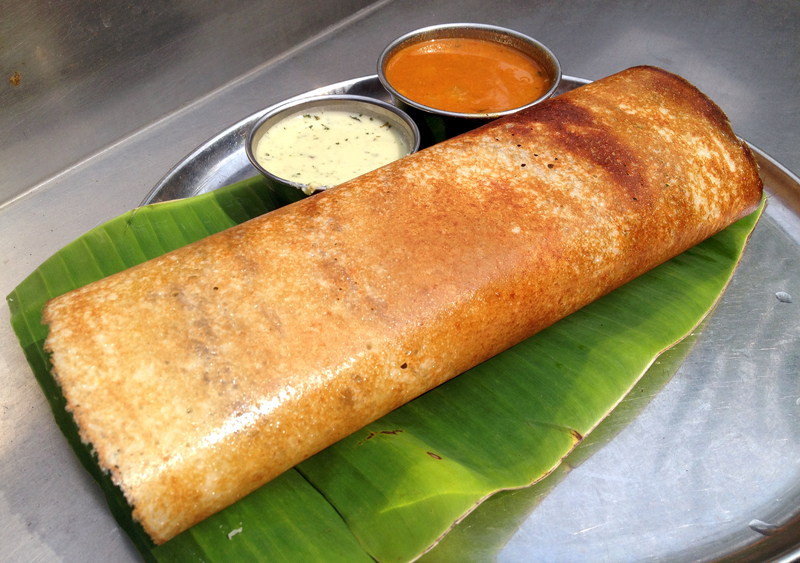 Blintz after blintz after blintz… just like dosai… losing count is too easy. You will need a heavy duty food processor to make dosa batter from scratch. A Cuisinart or Vitamix works best, but you can by with a blender. First, wash, rinse the rice and the lentils in separate bowls. Cover rice and lentils with water (leave about two inches of water on top) in separate bowls and soak overnight (or 6-8 hours) with the fenugreek seeds. Once soaked, add 3-4 tablespoons of lentil water to the food processor and turn it on. Then, slowly add the lentils while allowing the extra water to drain off. If needed, add water one tablespoon at a time. Grind lentils for about 15 minutes or until the batter is smooth and fluffy. Remove lentil batter and place into bowl. In the same food processor (don’t worry about washing it), pour one cup of soaking water from the rice. Turn the food processor on and slowly add the rice to the grinder. Grind for about 20 minutes until liquid batter is formed. It’s ok if the batter is slightly gritty. Remove from food processor and mix rice and lentil batter together with salt in a 3 quart bowl. Cover the bowl, but do not seal it (I recommend covering with a light towel)- this is where the magic happens! If it’s summertime, leave the batter outdoors (out of animals’ reach) for about 8 hours to ferment. The batter ferments best in a climate that is at least 90 degrees F. If it’s cold outside, put the batter on the lowest rack of you oven and turn the pilot light on. Leave the batter in for about 10 hours. Depending on the climate, the batter may take longer or shorter to ferment. But trust me, you will know when it happens! 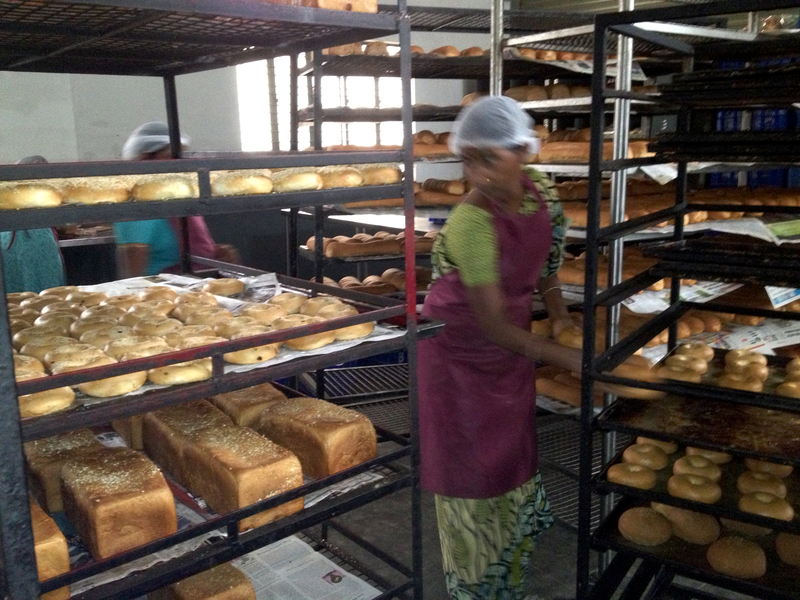 When the batter is fermented it will smell sweet and acidic, almost like beer. It will also be frothy and twice the volume you started with. After fermentation, the batter should be liquidy, like pancake batter. If it’s too thick to pour, add water. Heat a skillet on very high heat and brush with a drop of oil. Pour 1/4 of a cup of batter onto the skillet. With little pressure, spread into a thin circle with the back of a rubber spatula or spoon. 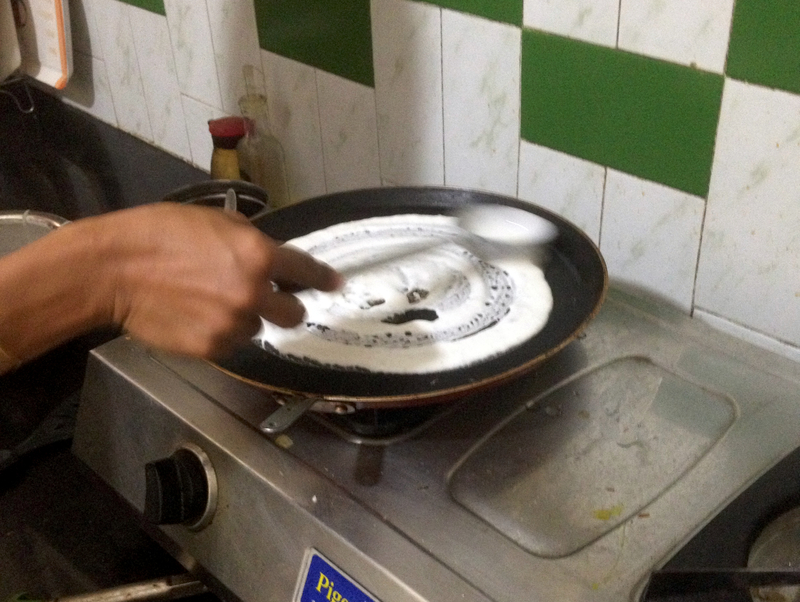 Cook on high heat until the bottom side of the dosa is brown. 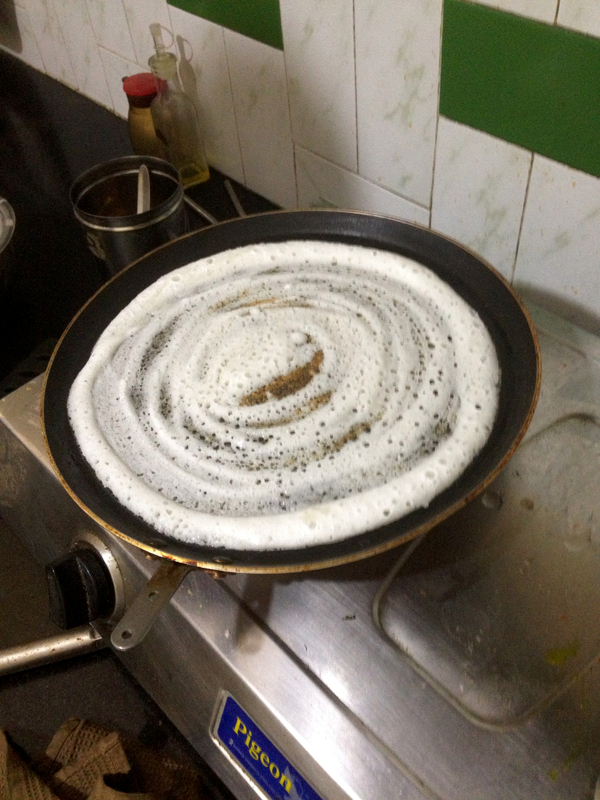 Flip the dosa to brown the other side. The dosa should be crispy on all edges. 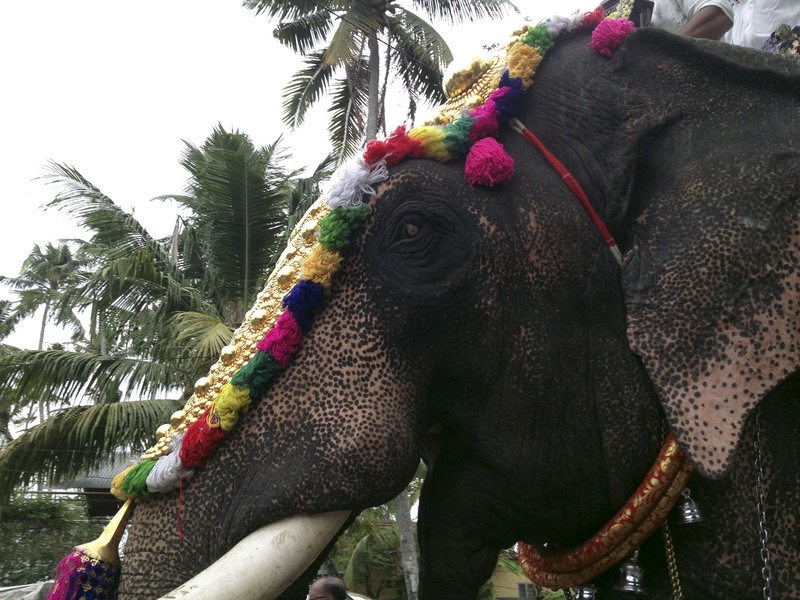 Serve with sambar and coconut chutney and enjoy! Heat coconut oil and spices in pan over low heat until fragrant. Allow to cool and combine with remaining ingredients in food processor until smooth chutney is formed. Garnish with cilantro. 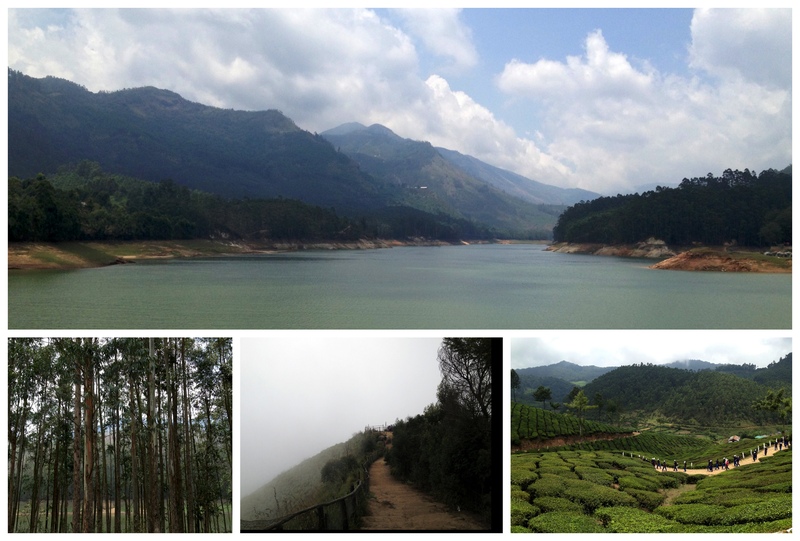 The bus ride from Ernakulam to Munnar was stunning. I went hiking in the clouds and sprained my foot. It was worth it. 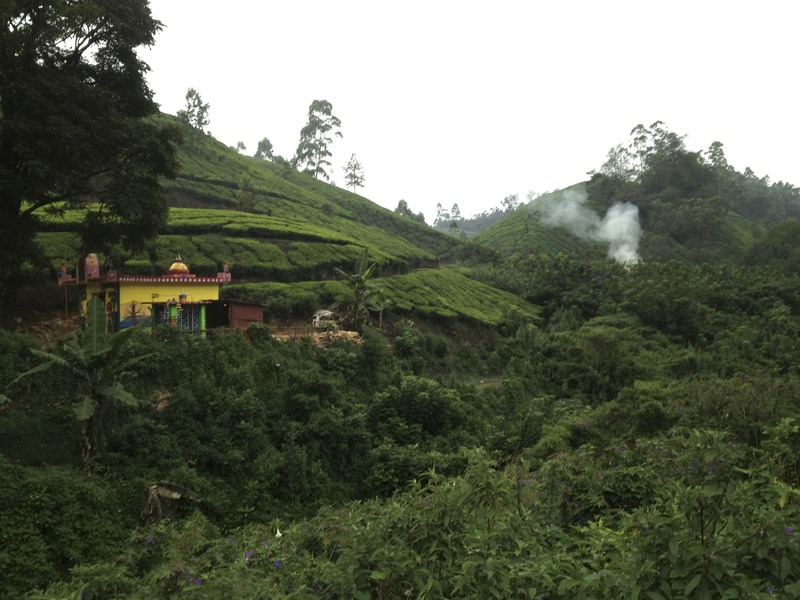 I visited a natural dye workshop called Aranya Naturals on one of Munnar’s tea plantations. All of the workers are differently-abled. 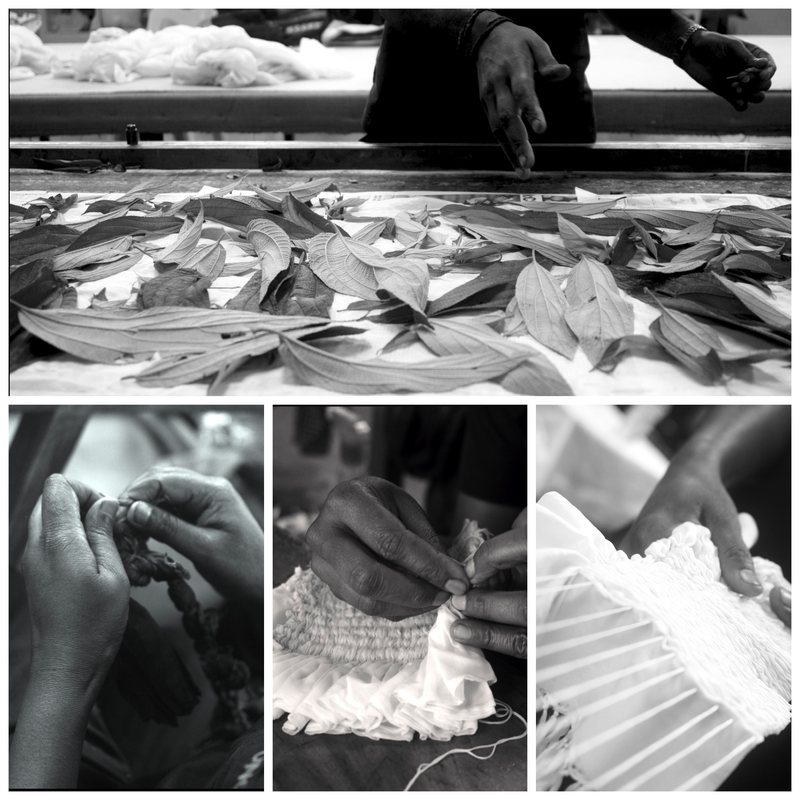 They create the most beautiful naturally dyed textiles with sophisticated shibori techniques. 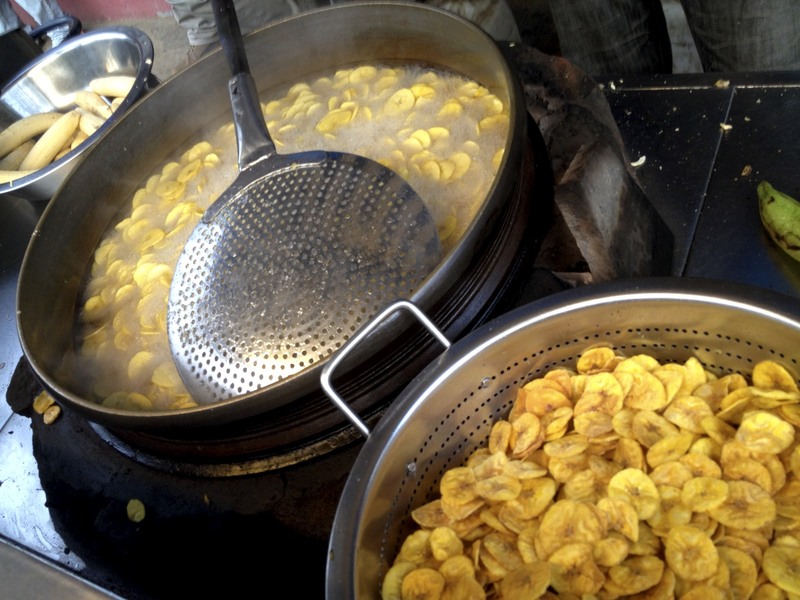 The food in Kerala… omg.. banana chips in coconut oil and appam. 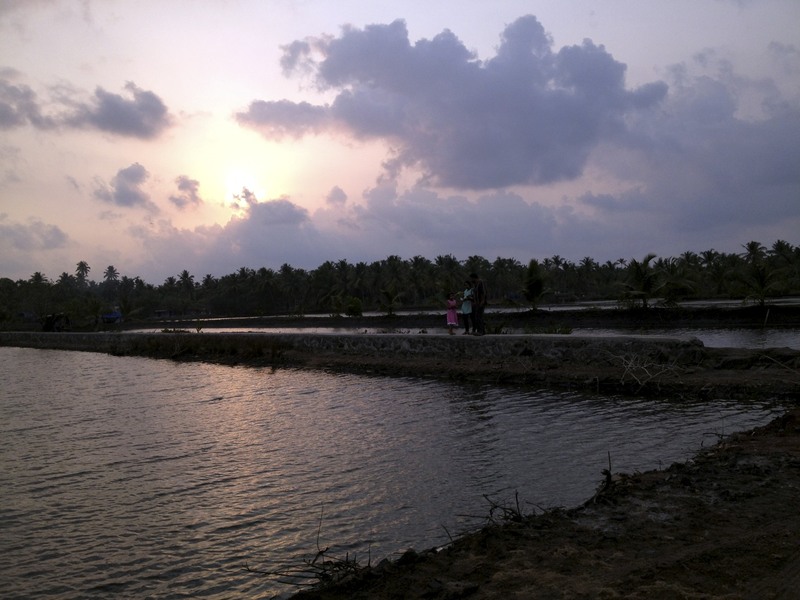 I’m in love with Kerala. After Munnar, I met Teresa in Cochin and we took day trips to beaches via ferries.. the best public transport this world offers. 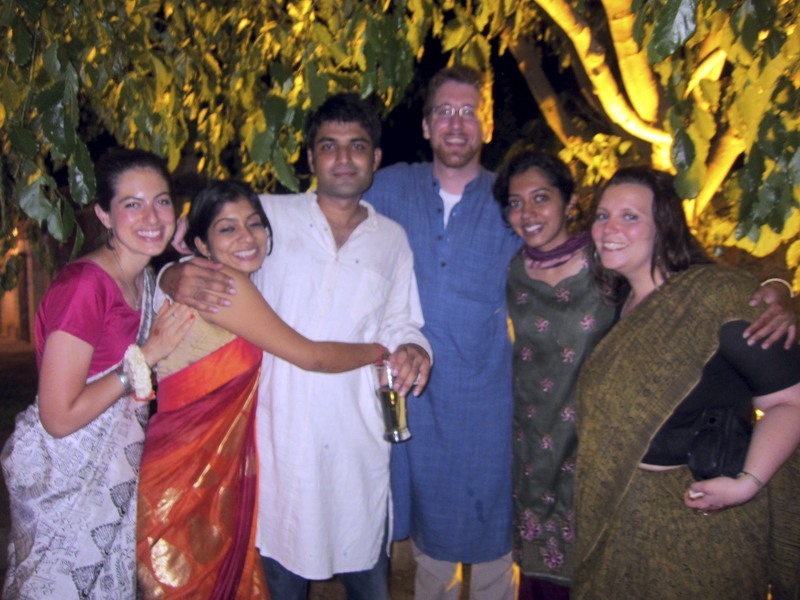 The Bhuj crew reunited for Priyanka’s wedding in Bangalore! The gang back together again.. a bit more classy this time around. Or not. 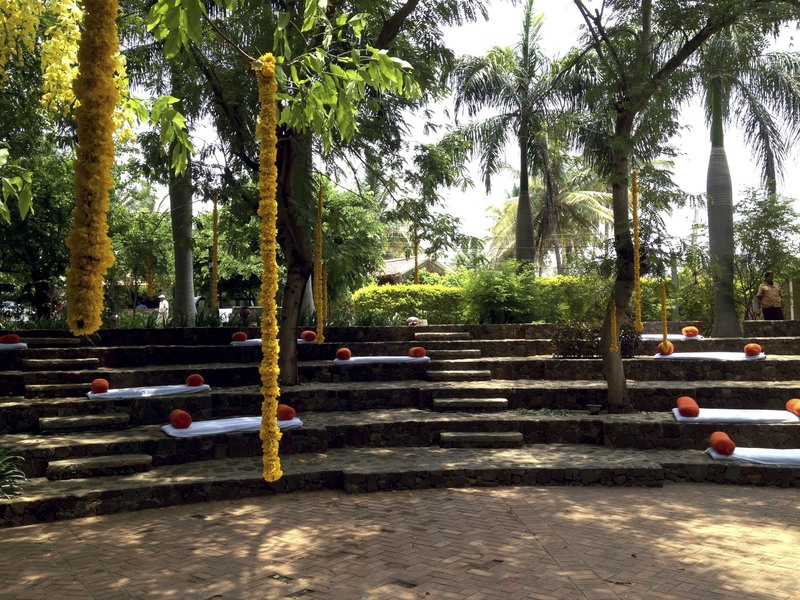 The wedding was as stunning. 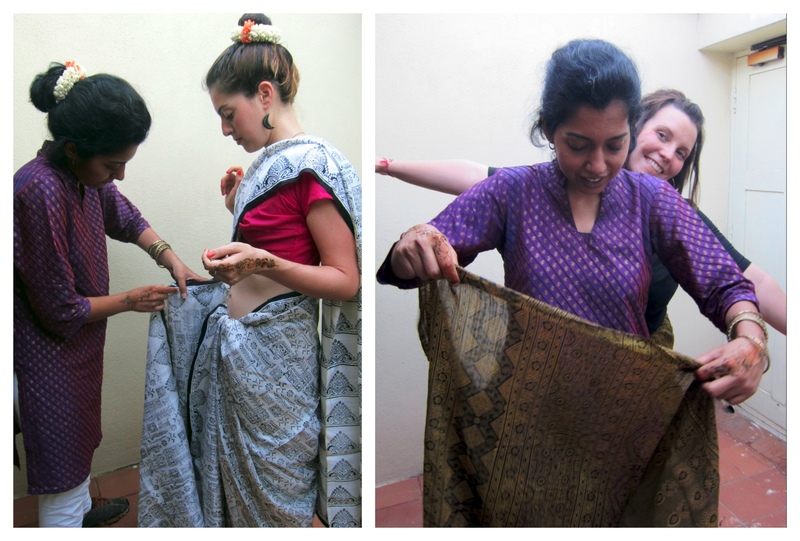 I borrowed saris from the master of sari beauty and elegance, Shruthi. The one above was printed by Ismael Khatri’s operation in Ajrakpur. 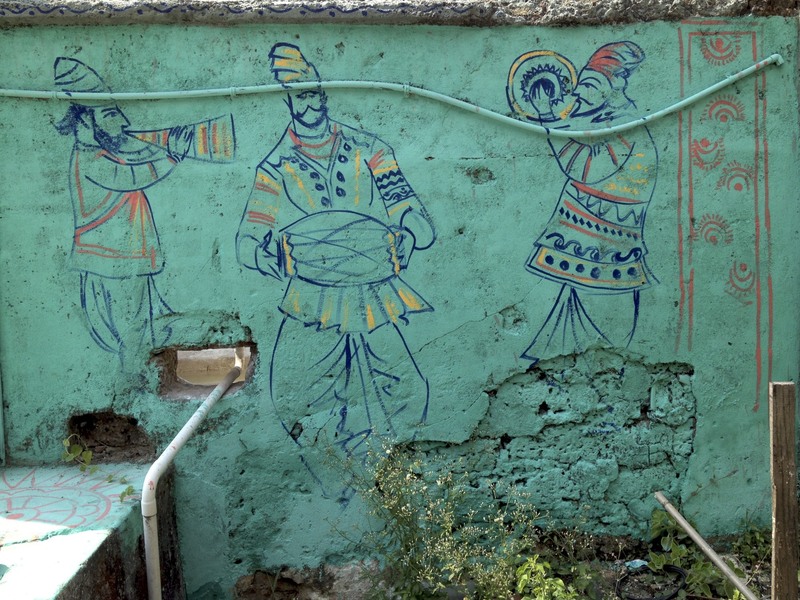 Also, Shruthi has an amazing blog about Kutch. Aditi, masterji, wrapped us up. 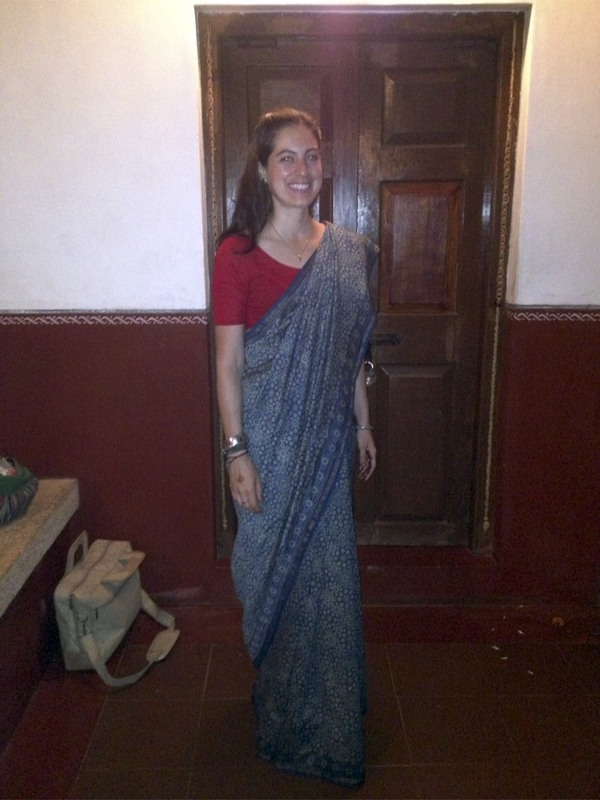 Never imagined I’d dance so hard in a sari and stay clothed. Somehow it worked. Thanks, Adu! I’m obsessed with auto decorations. Tibetan food in Darjeeling. Tsampa (roasted barley flour porridge) with cheese and milk for breakfast and Thupka (noodle soup) for dinner.